Item is a copy of Heitor Villa Lobos' third Bachianas Brasileiras in four movements, dedicated to "Mindinha" (Arminda Villa Lobos). 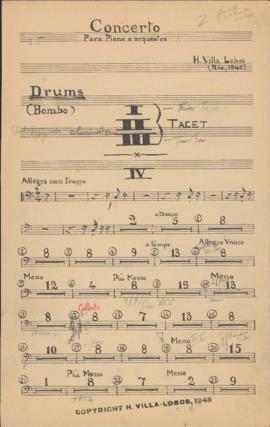 Item is a copy of an autograph version of Heitor Villa-Lobos' Bachianas Brasileiras No. 3, including performance notes. 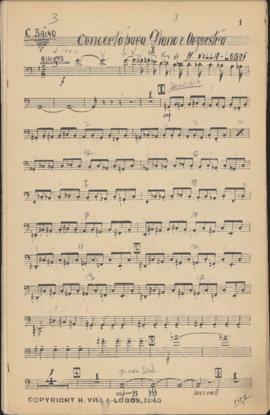 The score was reproduced and bound by Independent Music Publishers of New York City. item is a copy of the second movement and the cadenza portions of Heitor Villa Lobos' first piano concerto, dedicated to Ellen Ballon. Item is a copy of an autograph version of Heitor Villa-Lobos' second piano concerto, reduced for two pianos. 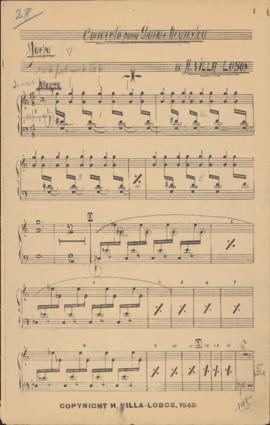 Item is the celesta part for Heitor Villa Lobos' first piano concerto, dedicated to Ellen Ballon. The part was copied by Fran Averede. The instrumentation has been crossed out in pencil and re-labelled "harpa" (harp). File contains five cello parts for Heitor Villa-Lobos' first piano concerto, dedicated to Ellen Ballon. The parts were copied by Fran Averede. 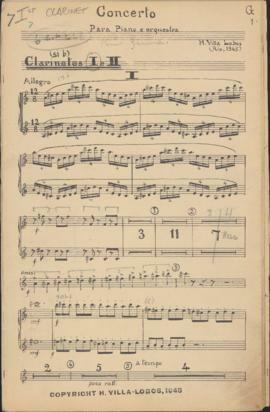 Item is one of five cello parts for Heitor Villa-Lobos' first piano concerto, dedicated to Ellen Ballon. The part was copied by Fran Averede. Item contains one of five cello parts for Heitor Villa-Lobos' first piano concerto, dedicated to Ellen Ballon. The parts were copied by Fran Averede. Item is the English Horn part for Heitor Villa-Lobos' first piano concerto, dedicated to Ellen Ballon. The parts were copied by Fran Averede. Item is the bass clarinet part for Heitor Villa-Lobos' first piano concerto, dedicated to Ellen Ballon. The parts were copied by Henrique Martins. 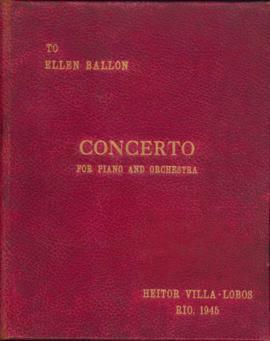 Item is the contra bassoon part for Heitor Villa Lobos' first piano concerto, dedicated to Ellen Ballon. This part was copied by Henrique Martins. 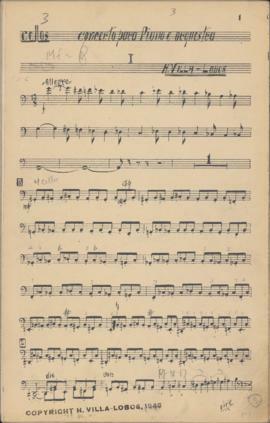 Item is one of four double bass parts for Heitor Villa-Lobos' first piano concerto, dedicated to Ellen Ballon. The part was copied by Fran Averede. 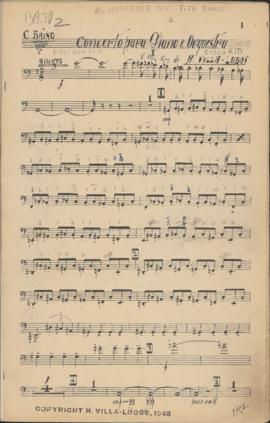 File contains four double bass parts for Heitor Villa-Lobos' first piano concerto, dedicated to Ellen Ballon. The parts were copied by Fran Averede. Item is the percussion part from a piano concerto written by Heitor Villa-Lobos and dedicated to Ellen Ballon. The part was copied by Henrique Martins. Item is the harp part for Heitor Villa Lobos' first piano concerto, dedicated to Ellen Ballon. The part was copied by Fran Averede. File contains the harp part for Heitor Villa Lobos' first piano concerto, dedicated to Ellen Ballon. The part was copied by Fran Averede. 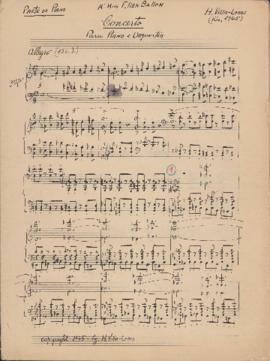 Item is an autographed manuscript of the piano part for Heitor Villa Lobos's first piano concerto. File also contains a copy of the autographed manuscript. 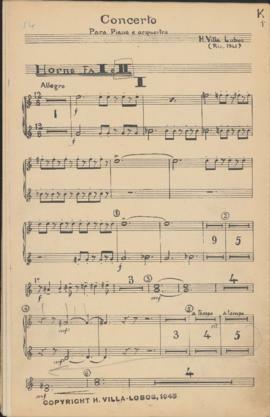 Item is the piccolo part for Heitor Villa-Lobos' first piano concerto, dedicated to Ellen Ballon. The part was copied by Henrique Martins. 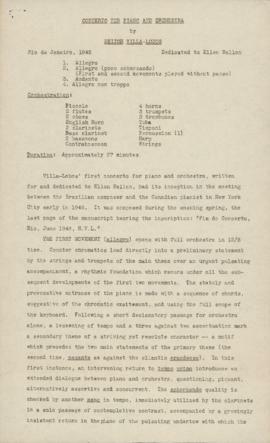 File contains the piccolo and oboe parts for Heitor Villa-Lobos' first piano concerto, dedicated to Ellen Ballon. 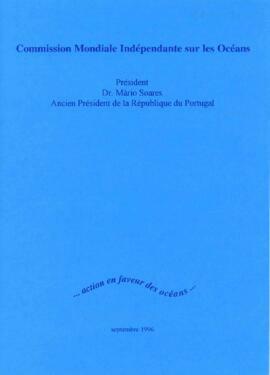 The piccolo part was copied by Henrique Martins and the oboe parts were copied by Fran Averede. File contains two copies of the first and second French horn parts for Heitor Villa Lobos' first piano concerto, dedicated to Ellen Ballon. The parts were copied by Henrique Martins. Item is one of two copies of the first and second French horn parts for Heitor Villa Lobos' first piano concerto, dedicated to Ellen Ballon. The parts were copied by Henrique Martins. 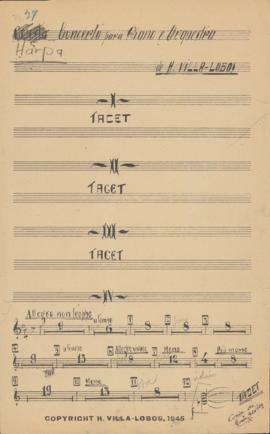 This part was used by the first French horn players. Item is one of two copies of the first and second French horn parts for Heitor Villa Lobos' first piano concerto, dedicated to Ellen Ballon. The parts were copied by Henrique Martins. 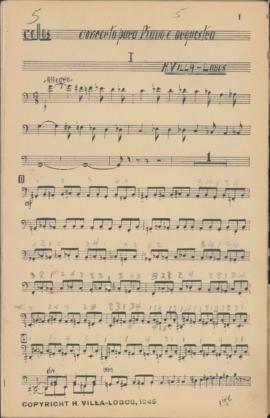 This part was used by the second French horn players. 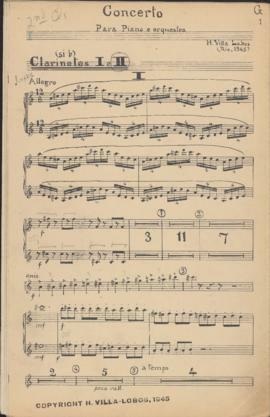 Item is one of two copies of the first and second clarinet parts for Heitor Villa-Lobos' first piano concerto, dedicated to Ellen Ballon. The parts were copied by Henrique Martins. 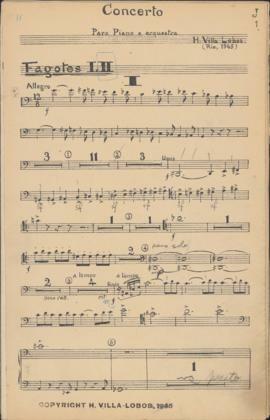 This part was used by the second clarinets. File contains two copies of the first and second clarinet parts for Heitor Villa-Lobos' first piano concerto, dedicated to Ellen Ballon. The parts were copied by Henrique Martins. 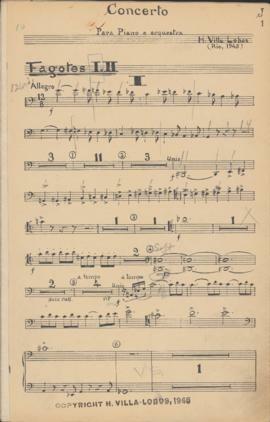 Item is one of two copies of the first and second clarinet parts for Heitor Villa-Lobos' first piano concerto, dedicated to Ellen Ballon. The parts were copied by Henrique Martins. 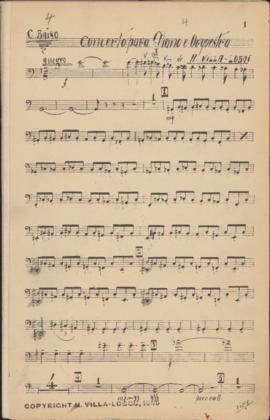 This part was used by the first clarinets. 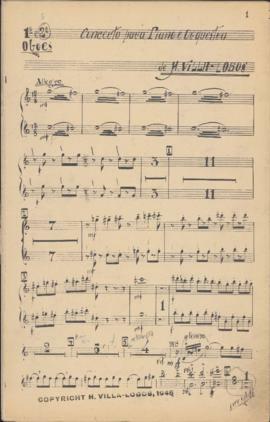 File contains two copies of the first and second bassoon parts for Heitor Villa Lobos' first piano concerto, dedicated to Ellen Ballon. The parts were copied by Henrique Martins. Item is one of two copies of the first and second bassoon parts for Heitor Villa Lobos' first piano concerto, dedicated to Ellen Ballon. The parts were copied by Henrique Martins. This part was used by the first bassoonists. Item is one of two copies of the first and second bassoon parts for Heitor Villa Lobos' first piano concerto, dedicated to Ellen Ballon. The parts were copied by Henrique Martins. 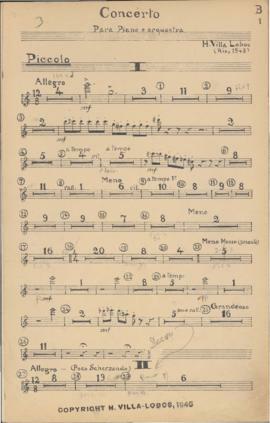 This part was used by the second bassoonists. 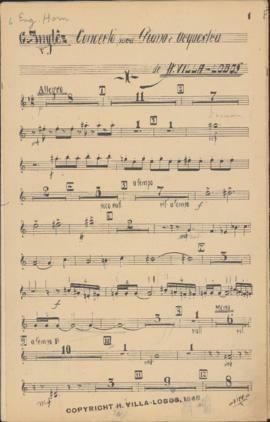 File contains the first and second flute parts for Heitor Villa-Lobos' first piano concerto, dedicated to Ellen Ballon. The parts were copied by Fran Averede. 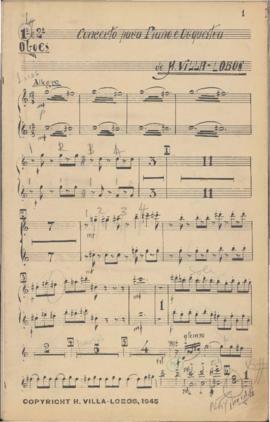 File contains one of two copies of the first and second trumpet parts for Heitor Villa Lobos' first piano concerto, dedicated to Ellen Ballon. The parts were copied by Fran Averede. 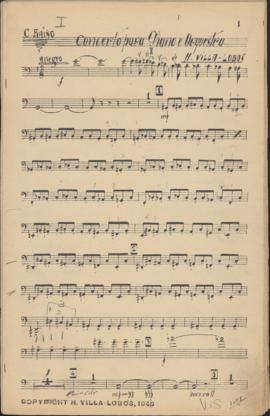 This part was used by the second trumpet players. 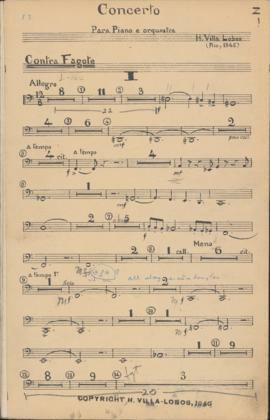 File contains one of two copies of the first and second trumpet parts for Heitor Villa Lobos' first piano concerto, dedicated to Ellen Ballon. The parts were copied by Fran Averede. 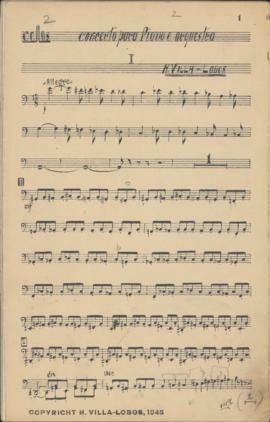 This part was used by the first trumpet players. 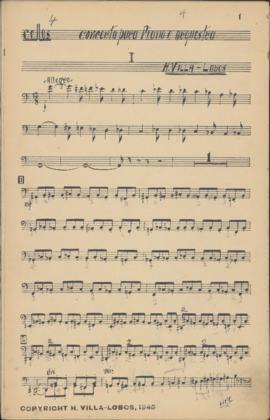 Item is one of two copies of the first and second trombone parts for Heitor Villa Lobos' first piano concerto, dedicated to Ellen Ballon. The parts were copied by Fran Averede. This part was used by the first trombone players. Item is one of two copies of the first and second trombone parts for Heitor Villa Lobos' first piano concerto, dedicated to Ellen Ballon. The parts were copied by Fran Averede. 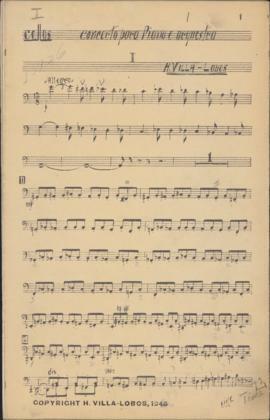 This part was used by the second trombone players. 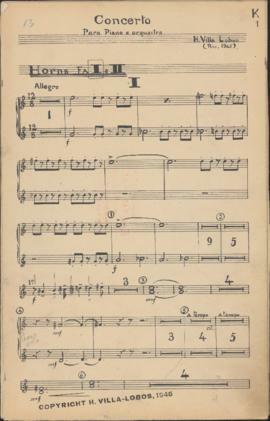 Item contains the first and second flute parts for Heitor Villa-Lobos' first piano concerto, dedicated to Ellen Ballon. This part was used by the first flautists. The parts were copied by Fran Averede. 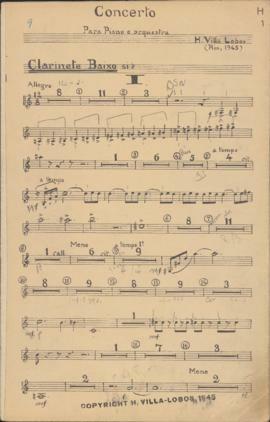 Item is one of eight first violin parts for Heitor Villa-Lobos' first piano concerto, dedicated to Ellen Ballon. The part was copied by Fran Averede.